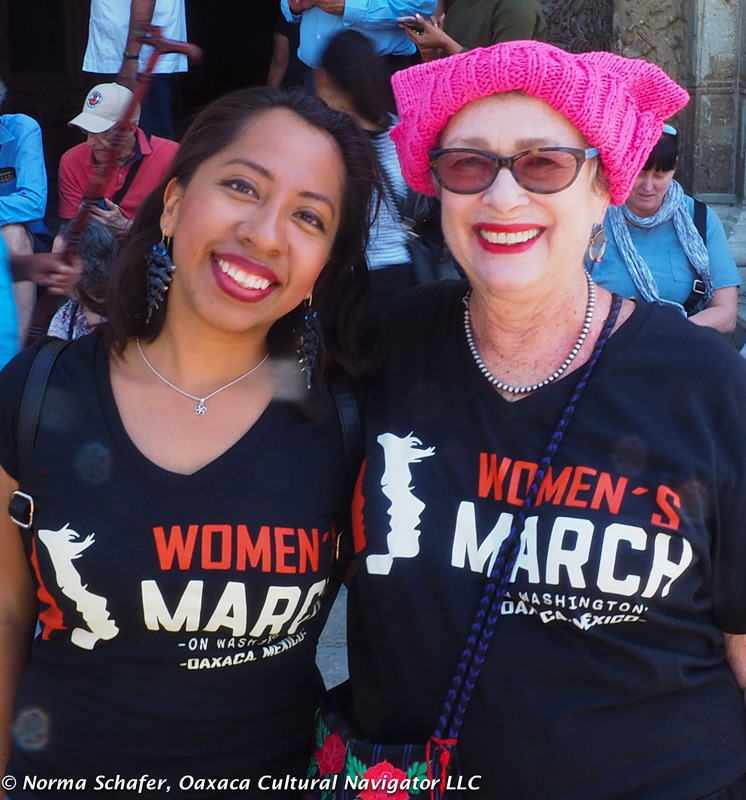 Women’s March Oaxaca: Just The Beginning! 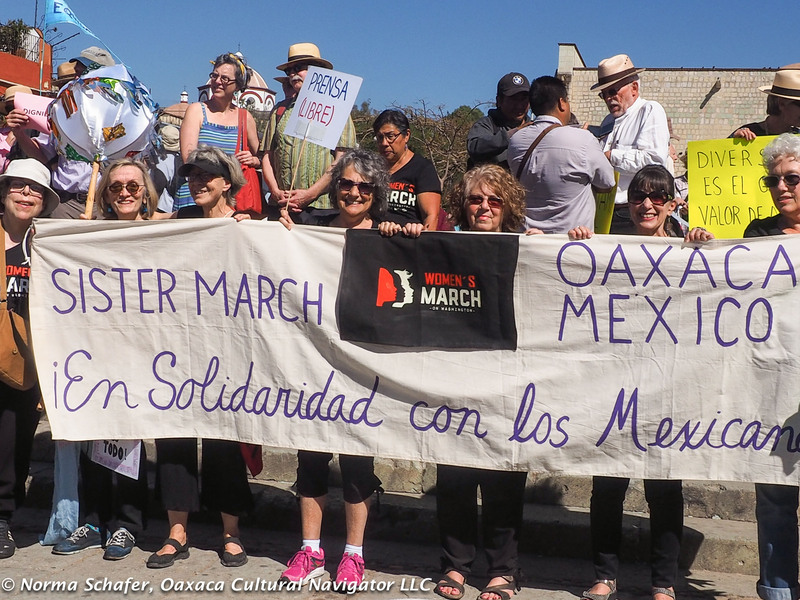 One of the organizers told me the traffic police took a count and reported 2,000 people marching in Oaxaca, Mexico, on January 21. Whatever the number, it was an amazing demonstration of peaceful solidarity to support this worldwide movement. 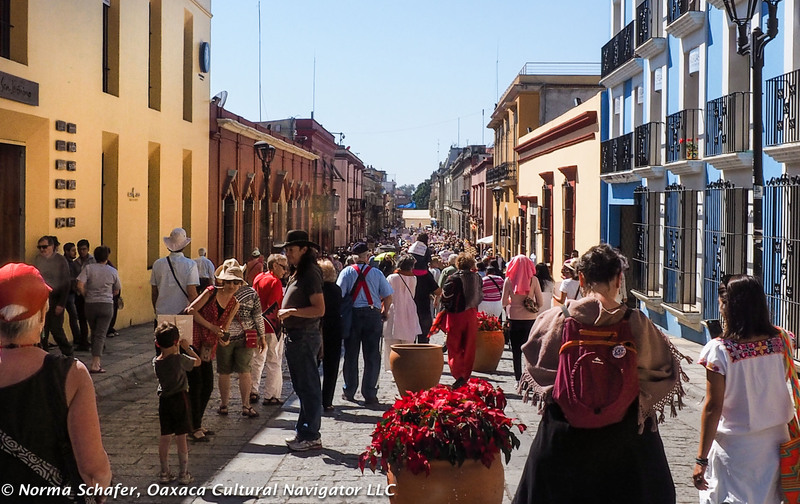 The Andador Turistica — Macadonio Alcala — the cobblestone walking street lined with restaurants and tourist shops in the historic center of Oaxaca, was packed with people. They were expats and Oaxaqueños, Zapotecs, Canadians, Estadounidenses, visitors and permanent residents. We gathered together to say to the world, this newly installed president of the United States of America does not represent our values. The signs say it all. 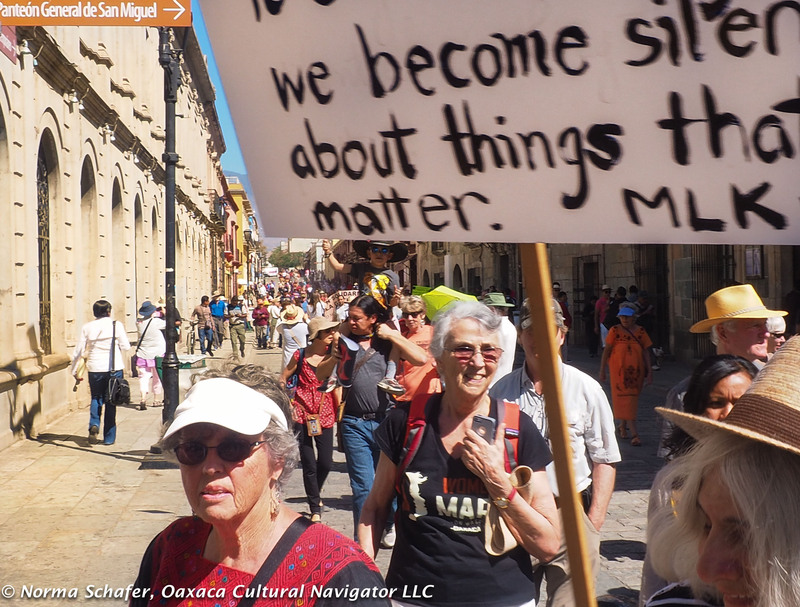 Click for a Compendium of Photos, News & Video at Engage Oaxaca! 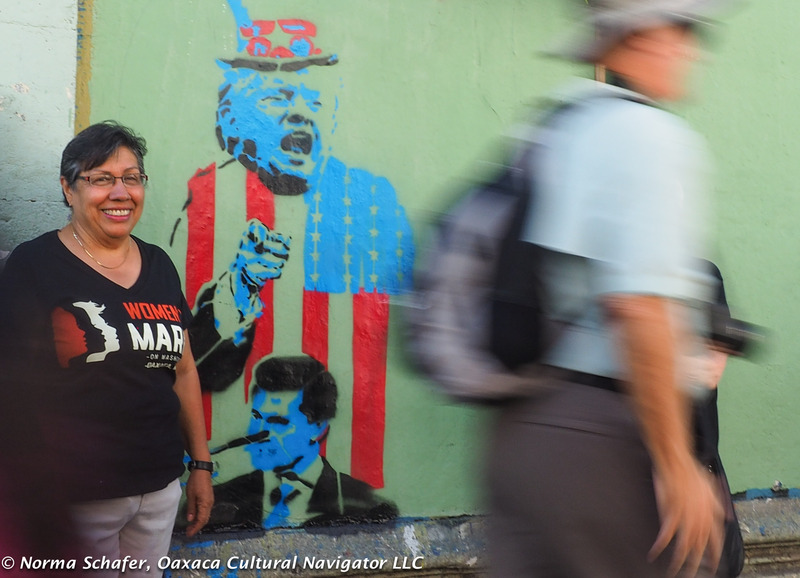 The 45th President on a Oaxaca Wall. The sentiment of the crowd felt serious yet celebratory. 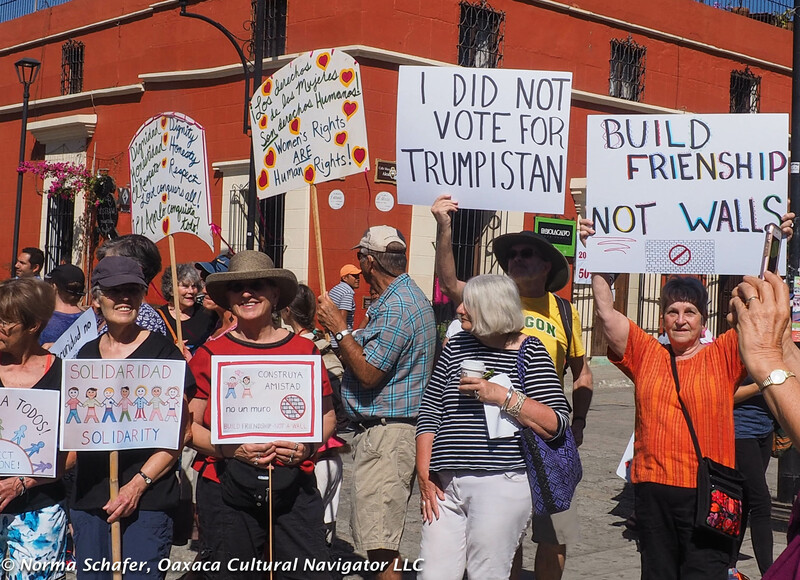 It was another gorgeous Oaxaca winter day with strong sun and a slight breeze as we started to gather in front of Santo Domingo Church for the 11 a.m. march. I could feel our energy, the exuberance welling as we channeled the frustration and anger we have felt in the last two months into positive action. 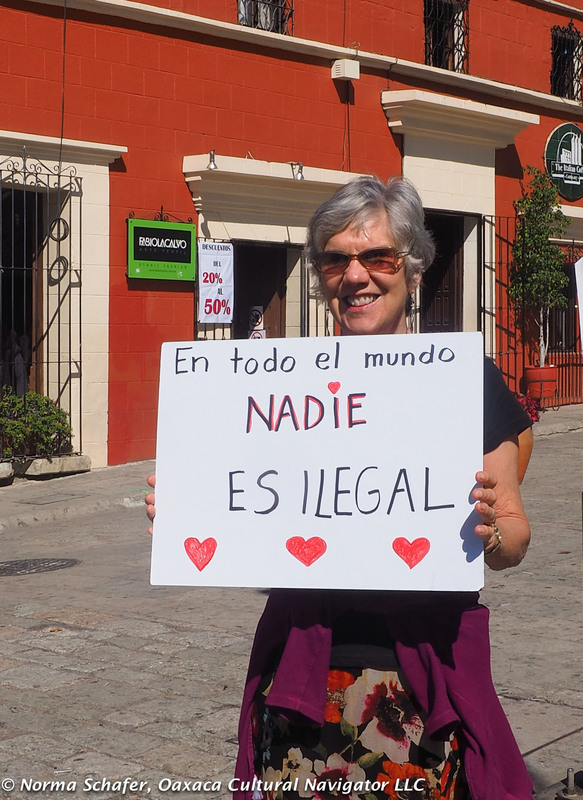 Mary Michal holds sign, In the entire world, no one is illegal. I was not out in front. I trailed behind, one of the stragglers at the tail of the snake. As I stood at the peak of the Alcala at the corner of Abasolo/M. Bravo, where the street gently descends to the zocalo, the massive number of people took me off guard. 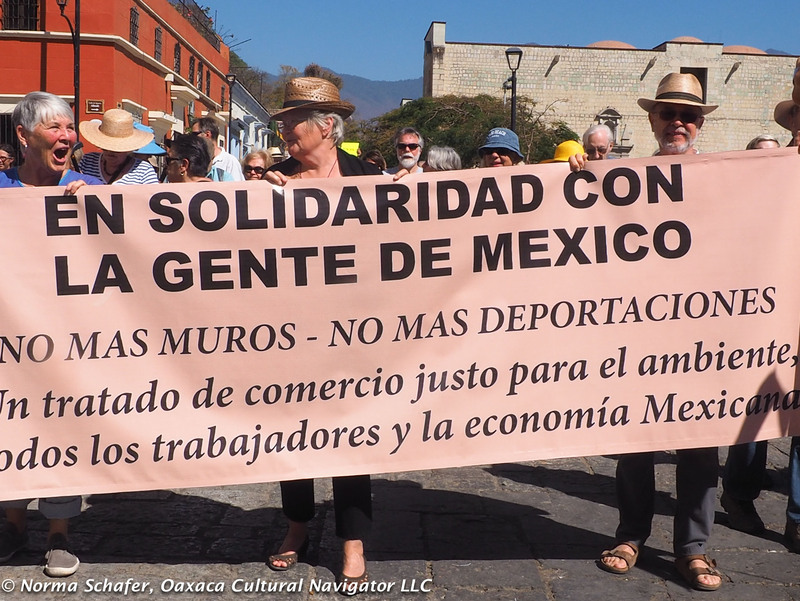 In solidarity with the people of Mexico! When I met with some of the organizers on Wednesday morning, the prediction was for between 60 and 100 people. They would be happy with 100, they said! 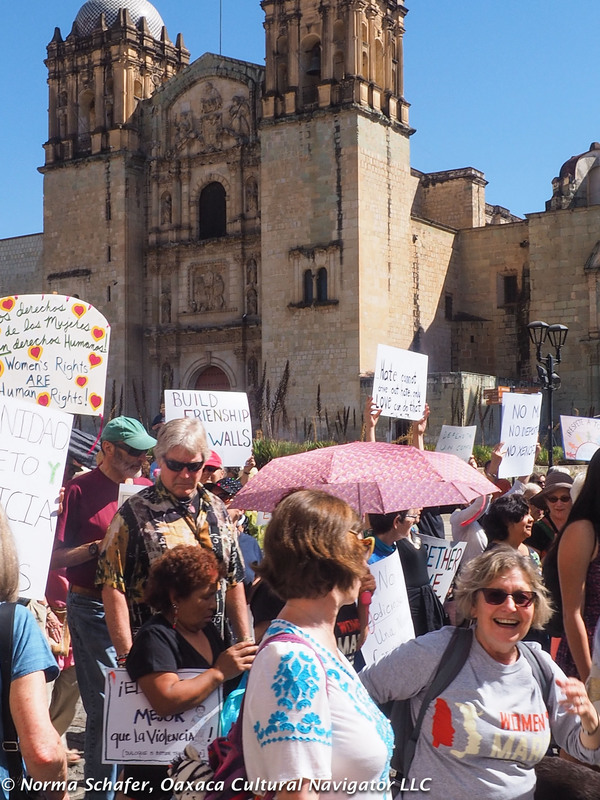 Demonstrators pack the Alcala in Oaxaca, Mexico. The message of this march is clear! We stand in solidarity with our Mexican friends and neighbors. We want a friendly relationship between governments. We do not support a wall. We stand firmly against the rhetoric of discrimination and xenophobia. Mexicans marched with us. Mexicans stood on the sidewalks and took photos and video. 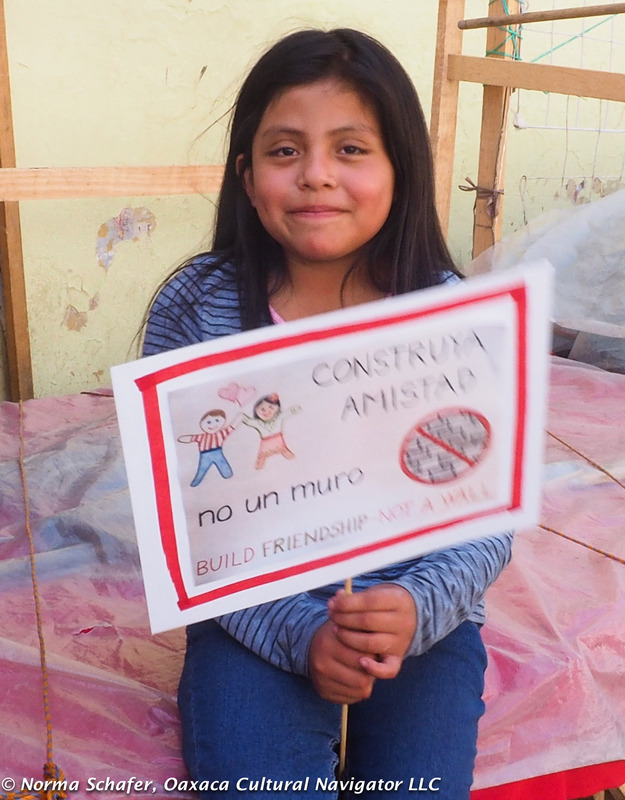 Mexicans thanked me for participating and speaking out. People of good faith everywhere were joined together this day. With the 16th century Santo Domingo Church behind us, we march. 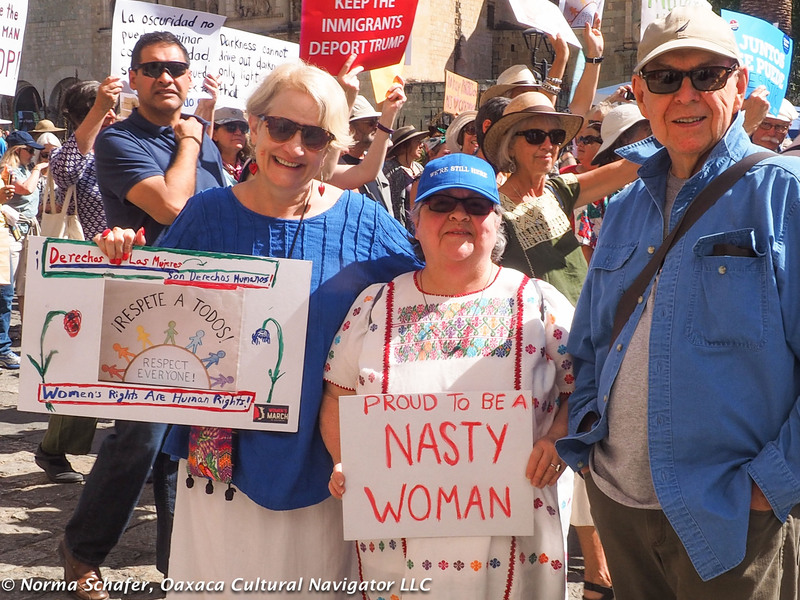 Proud to be a Nasty Woman! I thought of my son in Los Angeles, friends, people I do not know in every corner of the globe, especially those in Washington, D.C. on a gloomy, dreary day, making our voices heard for justice, free press, a clean environment, adequate health care coverage, equal, civil and human rights. The echo was resounding. For the future of all our children, we march. And, there is so much more do to. This is only the beginning. The momentum is with us. Do more than you ever thought possible. I will. 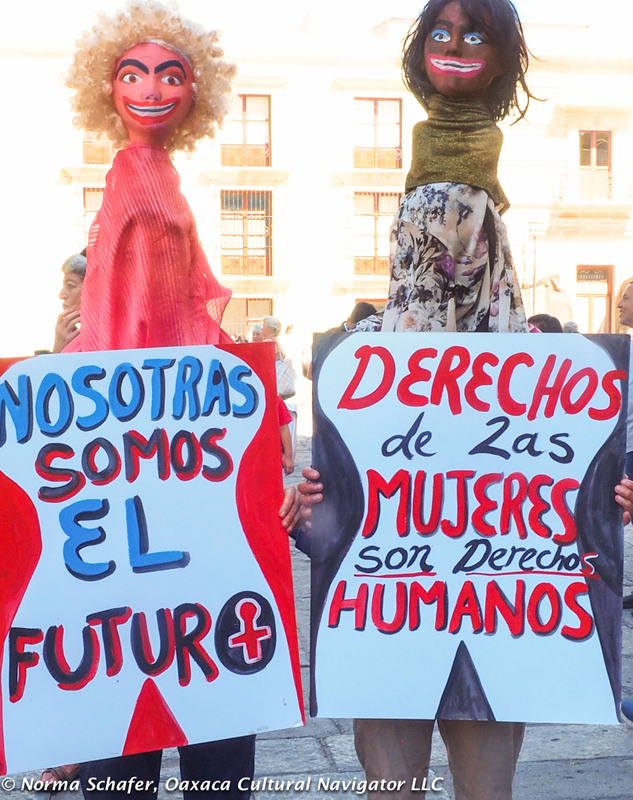 Human rights across race and gender. When the march ended at the steps of the Metropolitan Cathedral about 40 minutes after it began, no one wanted to separate. We were an organic mass of purpose. Some climbed the few steps at the front of the cathedral and began to sing, We Shall Overcome. They sang several times more. We had walked in silence. But we are not silent. We have a lot more to say. I’m part of the PussyHat Nation, er … world. 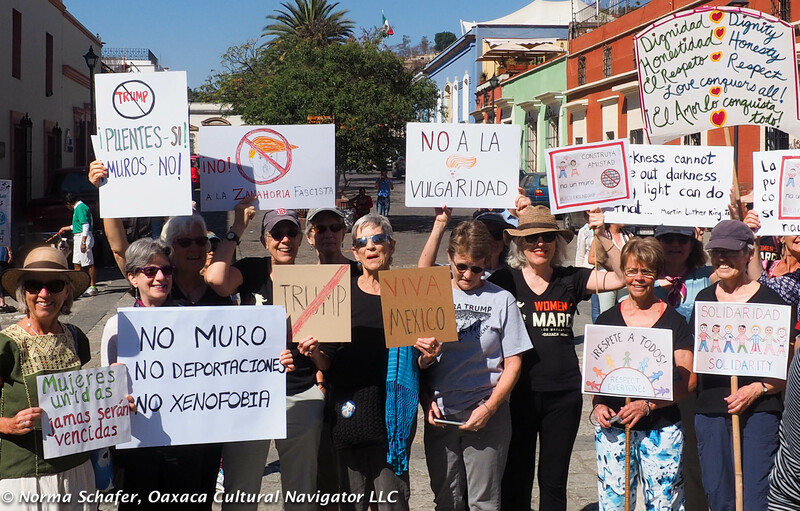 Thank you to the dedicated team of organizers who formed Engage Oaxaca to create this: Jacki Cooper Gordon, Roberta Christie, Shannon Pixley Sheppard, Nancy Clingan, Vicki Solot, Kathie McCleskey, Jess D’Great, and Erica Fox. We will not be silenced, bullied or intimidated.